You’ll be surprised at how this 8 inch subwoofer hits hard despite its size. This is one subwoofer that can replace the default speaker in your car. 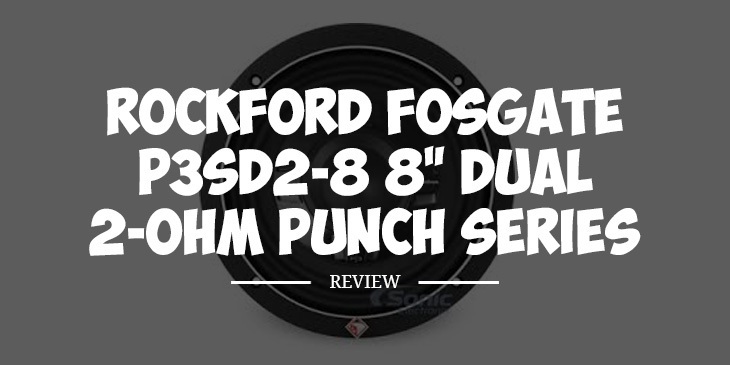 Whether the latter has been blown out or you just want to replace it, you will find this Rockford Fosgate subwoofer the perfect replacement. this is a shallow mount subwoofer that has a top mount depth of less than 3 inches. Installation should be a breeze with this subwoofer. so it can fit in smaller locations in your car. Most reviewers on Amazon.com say they place this behind the back seat. Others slide this under the driver’s seat, so they can feel every beat coming from it. This subwoofer has dual 2-ohm voice coils, giving motorists and owners more flexibility in wiring it. It can be wired in parallel for a 1-ohm load. Its voice coils can also be wired in a series parallel for a 4-ohm load. it can increase the mounting height of the woofer by around one inch. It can also increase the ring’s diameter by around 9 inches. This subwoofer is compatible with both sealed box and ported enclosures. For sealed enclosure, Rockford recommends a maximum internal volume of 0.25 cubic feet. Sealed enclosure is popular for its ability to handle a lot of power. It is suited to all kinds of music. On the other hand, Rockford suggests an internal volume of 0.75 cubic feet for a ported enclosure. It has a Flex Fit frame that makes use of slots instead of single screw sized holes. This allows for adjustment on the mounting of the speaker. Q. How clean is the mid-bass on this sub? A. It is pretty decent for a 8-inch sub. Q. Do you need batteries for this subwoofer? A. Yes, it requires one 12 volt batteries. This Rockford Fosgate subwoofer is very thin that you won’t really have problems looking for a space to mount it. It can replace those speakers on the door panels, or you can put it in a sealed enclosure and mount it behind the car seats. This is a subwoofer that won’t take up a lot of space in the cabin. Although this subwoofer won’t blow you away with its bass output, it delivers relatively satisfactory low notes. You should be able to feel and hear every low note. I also like that it is reasonably priced compared to its competitors. This is one is a top rated subwoofer that I can recommend to motorists who want to get the most out of their subs.